In the book Inspirations (published by Martin Breese 1987) I included an effect called 'Envelope Prediction'. This is a different version which I performed as part of my close-up act at the Blackpool convention in 1979. There is no palming or copping of cards, in fact you could call this near-self-working! A card is selected and lost back into the deck. You give the spectator an old coin/medallion which they hold in their hand. This, you say, will send "truth waves" to the deck. You now ask the spectator a series of questions about his card: he can either lie, or tell the truth. Is your card RED or BLACK? Is your card a SPOT card or COURT card? What is the SUIT? After each reply, you cut, and then turn over the top card of the deck which reveals the true answer. Now, you ask the spectator to drop the medallion into your coat pocket. After some byplay, you ask him to reach into your pocket and bring out what he finds. He finds a playing card. Not just any card, but his selection. Finally, you turn over the three answer cards and these have now changed into the three mates of the selection! You remove the Ace through Ten of Diamonds and set them in numerical order on the table. A spectator now selects any other card from the deck, which is then lost back into the deck through shuffling. You pick up the Diamonds packet and spread the cards face upwards displaying the numerical arrangement of Ace through Ten, as you ask the spectator to name any number between One and Ten. He might choose 7. You flip the 7D face down, maintaining its place in the sequence, then you close the spread and turn the packet face down. After a magical gesture, you spread the cards, counting to seven - the seventh card is face up (as expected), but it is no longer the 7D, instead it is now the spectator's selected card! The 7D is now produced from your pocket. You remove the two black Jacks and lay them on the table. A spectator now selects a card which is lost back into the deck. You now pick up the black Jacks and very cleanly drop them square on top of the deck. Instantly, they collect one card. This proves to be the selection. "You may wonder why I used the black Jacks and not the red Jacks?" you ask, "Well, the red Jacks were carrying out another task." At that, you spread the deck revealing the red Jacks reversed in the middle, with three cards trapped between them. These three cards are the mates of the selection. The following is a solution to a problem posed by Roy Walton in Cardboard Charades (also The Complete Walton Vol. 1) in an effect called "Unaccustomed as We Are". The problem was; to perform Dai Vernon's Twisting the Aces without counting the cards. Another approach to the Lie Detector. You place a packet of four cards in a face down pile on the table. This, you say, is a cardboard lie detector. A spectator is now offered a free choice of any card from the deck. This card is placed at the bottom of the lie-detector packet which remains on the table. You now ask a series of questions to which the spectator can either lie, or tell the truth. Each time he answers a question, the top card of the packet it turned over revealing the truth every time. You remove the Royal Flush in Spades and place the rest of the deck away as it is no longer needed. With all five cards face down, you now cause the 10 to turn face up. You deal this card to the table (or onto a spectator's hand). You only have four cards. Next, you cause the Jack to turn face up. You deal the Jack to the table. This leaves you with three cards. The Queen turns face up - you deal it to the table. Only two cards remain in your hand. You push these through your fist and the King is face up. You deal this to the table, too. Finally, the Ace disappears and is found in your pocket. No palming. A spectator selects six cards from the deck, and then he selects one more as his personal selection. The selection is mixed into the packet. Now you demonstrate how playing cards follow each other like sheep. You turn the top card face up and suddenly all seven cards are face up ... except for one stubborn card that remains face down. Not only that, but all the cards are black. The face down card is turned over and, not only does it prove to be the selection, it's also the only red card! Two spectators each select a card. Both cards are lost back into the deck. The first selection now travels to your pocket. This selection is left in full view, protruding from the fanned deck (or it could be placed under you collar, etc. You say you will now make the selection travel to your pocket again. After waving the fan, and with empty hand, you again reach into your pocket and bring out a card. When you turn this card around it proves to be, once again, the first selection. Finally, you slowly lower the fan revealing that the card sticking out of the fan has changed into the second selection. You give a spectator a packet of eight cards. With the cards face down, he cuts the packet and deals the top card onto the table. Taking the remaining cards, you mix them face up and face down. A snap of the fingers and all the cards right themselves with the exception of one card. This card proves to be the matching mate of the card selected at the start. B-L-A-C-K-S-T-O-N-E. The letter-cards are mixed and then you turn away while a spectator cuts the packet and pockets any letter. Next, you turn to a second spectator and ask him to shuffle the deck of playing cards and select any one. 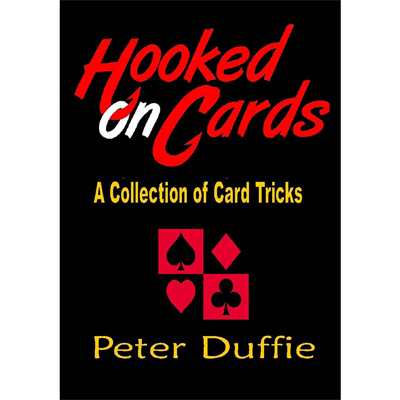 He signs his name across the face of the card, and then it is returned to the deck and lost during a shuffle. You now ask the first spectator to think of the letter he chose. After some concentration, you are able to name the letter. You thank the Great Blackstone for helping you. You now say that this letter will help us find the second spectator's signed card. Let's say the letter is "K". Taking up the deck you (or the spectator can do it) start to spell out the alphabet, while dealing one card for each letter: "A ... B ... C ... D ... etc". You stop when you reach the letter chosen by the spectator - in this case you stop when you reach "K". You turn over the card, but it is not the selection! Has the Great Blackstone let you down? No. "In fact," you say, "the great man decided that my trick wasn't good enough, and so he has intervened to create a miracle instead." At that, and with empty hand, you reach into your breast pocket and cleanly remove the signed selection.